Property 9: Oceanfront, immac 2 bed, Sleeps 4 adults, big block, shady garden, views. Property 20: Sandbar Holiday House - Central, River Frontage! 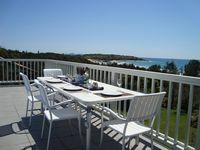 Property 22: Whale Watch 1 bedroom self contained apartment. Regatta on Rudder - Dog Friendly! Property 23: Regatta on Rudder - Dog Friendly! Stayed for 2 weeks over Christmas/New year 2018/19. Neat, clean and well stocked home. Was worried about no AC however that was never an issue. Magnificent seabreeze all day and night, every day and night. Had a small problem with the TV tuning which was immediately rectified by the owners. Very friendly and helpful people. Short walk to beautiful Safety Beach. 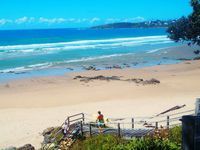 Only 5 min drive into Woolgoolga and equally short walk along the beach. Highly recommend this spot. Hope to return ourselves soon. Great spot. We had Christmas there - marvelous time. The house is rustic but so spacious, kids loved the games room and we all loved the views day and night and the beach is so close.